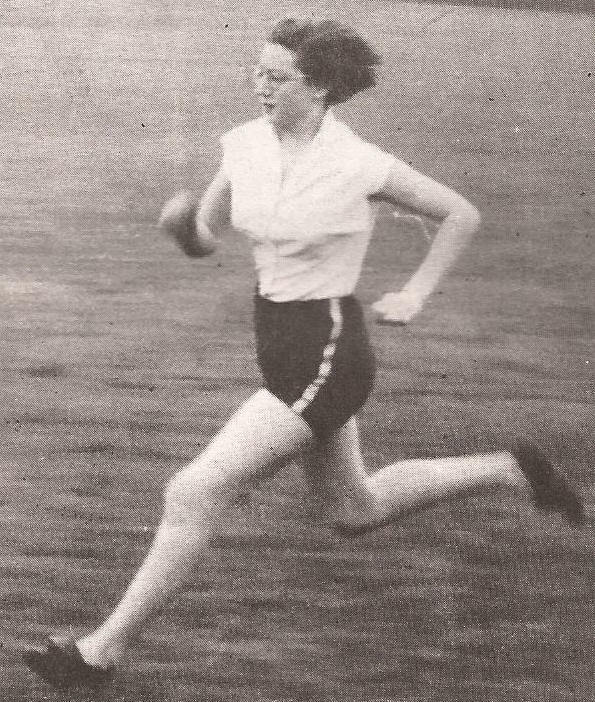 Molly Ferguson was a well-known and talented athlete in Scottish athletics in the 1950’s and 60’s. She is still seriously involved in the sport as an official, and still with the same club, but known as Molly Wilmoth. Molly and husband Danny are one of the best known and respected couples in the sport and their contribution was recognised by the granting to them of a Lifetime Achievement Award by Scottish Athletics in 2004 and we’ll come to that in due course. Molly has had one of the finest careers in the sport that could be imagined – a very successful athlete who became a top ranked official and was recognised in many ways as a talented administrator. Albert Secondary School Sports champion in 1951, she joined Springburn Harriers straight from school in 1953 and went on to win two SWAAA 880 yards titles and run for Scotland in internationals on the track and over the country. 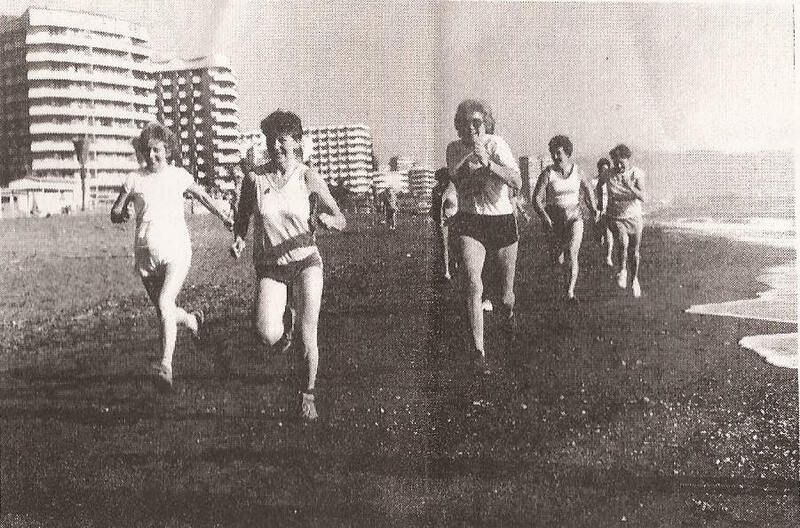 The Fifties were critical development of Scottish women’s athletics: it went into the Sixties in much better shape than it had been ten years earlier. The transition is marked dramatically when we look at the SWAAA Championships. At the start of the decade there were only 14 events and they were all for Seniors with only two or even three for Inters (ie Under 17). In 1960 there were no fewer than 39, including events for Internediates and Juniors which included track, field and relays. She also helped the women’s association get involved in annual international fixtures. 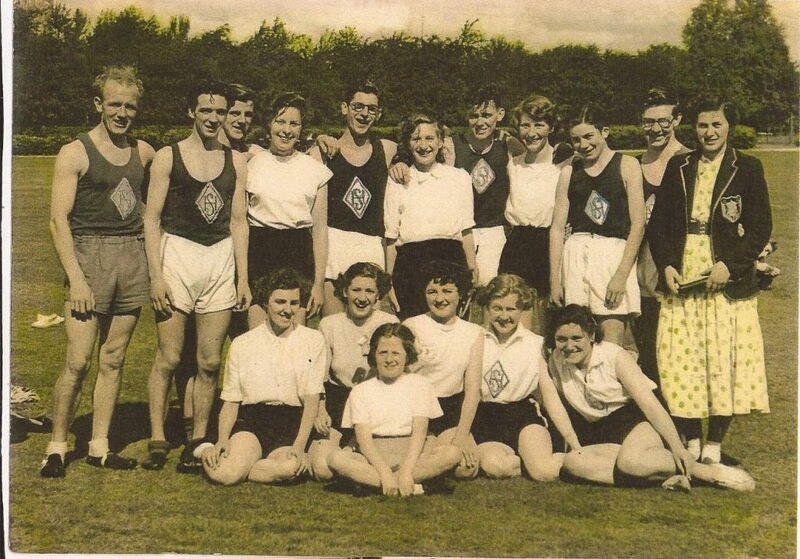 After joining Sprinngburn the young Molly Ferguson started racing against the Seniors in 1953/54 and in the women’s cross-country championships in March 1954 at Dunfermline she was fourth over the two and a half mile course behind Aileen Drummond (Maryhill), Margaret Wadler (Athenians) and B Moffatt (Athenians). It was a good year to be running well for reasons apparent from the following article from, I think, the ‘Evening Times’. “WOMEN COPY THE MEN – AFTER 51 YEARS. A fairly realistic assessment and preview was contained in this article. “SCOTS GIRLS ON SOUTH TITLE HUNT, by Alick Kerr. EASY WIN FOR ENGLISH WOMEN HARRIERS. That was on 14th August and Carluke Highland Games were later the same month. Molly won the 220 yards off 9 yards in 27.2 seconds. Shotts Highland Games were held in September. This was a handicap race and Nessie Elder , running off 28 yards won from Molly who was off the same mark and Aileen Drummond who was running from scratch. It should be noted that in 1954 Aileen was the SWAAA champion at both 880 yards and the Mile as well as being Scottish cross-country champion. At the season’s end the Press returned to the theme of ‘more middle distance races for women’. I quote from two that appeared at the end of the 1954 season. WANTED – MIDDLE DISTANCE RACES. Frankly I have very great sympathy with my correspondent and agree with much that she has written. Making allowances for Miss Leather’s generous and natural tribute to her hosts, we do have fine runners who lack competition. While it is true that Pat Devine and Elspeth Hay have travelled south for keener competition, EMS (if she meant Eileen Sealey) has not gone to Australia for that reason, though she is in athletics there and expects to be home for the start of next season. “A women’s athletic club which will begin the new season with quite a strong touch of class about their membership are Springburn Harriers. 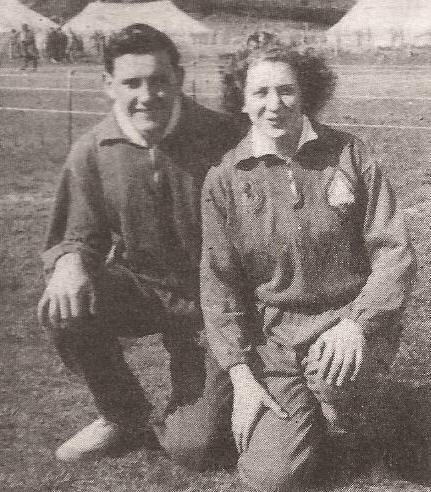 Their secretary, Molly Ferguson, is herself the holder of two cross-country international ‘caps’. one of which was gained as recently as last month against England, and by her personal example both on and off the track, is an inspiration to many of the younger athletes in the club. SECOND TO AILEEN. Then there is Doreen Fulton who gained a place in the same Scottish team this season, and did so well in the Scottish championships finishing second to Aileen Drummond. To add further distinction, the club now have Margaret Black. Scottish women’s Intermediate high jump and long jump champion and Jean Muir who last season won the Scottish schoolgirls junior hurdles championship. With another score or so of promising athletes at their disposal, Springburn promise to test the best. AYR RACECOURSE POPULAR FOR CROSS-COUNTRY. D Leather 16:08. 2. A Oiver 16:31. 3. L Buckland 16:45. 4. J Bridgland 16:57. 5. M Davis 17:00. 6. M Wooller 17:01. Scotland: 7. C Boyes (18:18), 8. A Drummond (18:40), 9. E MacLeod (18:47), 10 M Ferguson (19:15), 11. D Fulton (19:20), 12 A Elder (19:25). 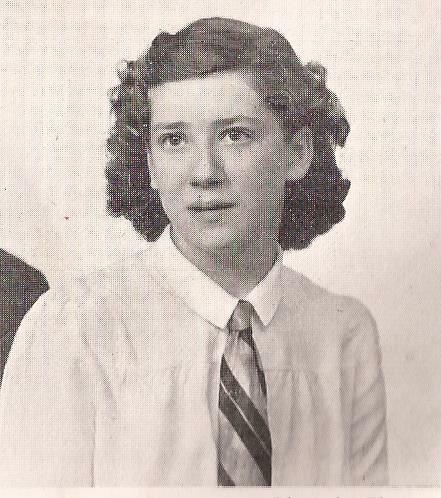 Note that it was a ‘cross-country championship’ in the singular with all ages in the same race – second finisher Cathie Boyle was only 15 – and in the absence of female equivalents of Dunky Wright and Jimmy Scott, the women had to make their own way and set up their own championships in addition to running in them. That the sport of endurance running in Scotland progressed to the present day standards is due almost entirely to the women such as Molly and Aileen in the 1950’s. In the SWAAA championship that year the resut of the 880 yards was 1. Aileen K Drummond 2:30.8, 2. Elizabeth McLeod (Unatt), 3. Molly Ferguson – two SWAAA Championships, two medals for Molly. She also ran in the 220 yards where she was third in her heat but unplaced in the final. Later in the year, on 27th July, Molly won the 220 yards at the Ardeer Recreation Sports in 28.5 seconds off 9 yards from CD Watson (Springburn) and E Junner (Bellahouston). There was also a major 440 yards at Cowal with Molly, Aileen, Ann Reilly and Anna Herman in front of the normal big Cowal crowds. 1956 started with an open cross-country championship held on 27th January with five clubs (Ardeer, Ayr, Clydesdale, Maryhill and Springburn) contesting the team competition. Doreen Fulton of Springburn won the race in 14:52 from Molly Ferguson in 15:12 with the reigning cross-country champion Aileen Drummond third in 15:52. The next three places were taken by local Ayr runners – Claire Thursby, Joyce Thursby and Jean Norris to win the team race. In the National Cross-Country Championships at Musselburgh the first six again qualified for the Scottish team for the international and the winner was again Aileen Drummond (16:26) from Doreen Fulton (16:30) and JC Herman (Edinburgh Southern Harriers – the reigning SWAAA 440 yards record holder with 58.3). Molly was fourth, Mrs Steedman (Lewisvale Spartans fifth and Margaret Campbell of Maryhill sixth. Maryhill won the team title and Ayr was second. It was noted that Aileen Drummond will not run for Scotland in the International but Mrs A Lusk has kindly obliged to step into her place. After a hectic week end Aileen was married on Tuesday to Mr Hugh Lusk at St John’s Renfield Church. In the international at Musselburgh in March, England took the first six places with Diane Leather being the individual victor for the third year. It was a good year for Springburn Harriers since John McCormick was in the Scottish men’s team that year giving the club three cross-country internationalists. There were two high-class international races held that summer in which Molly took part. The first was at Murrayfield on 18th August with three Scots (Molly, Ann Reilly and Barbara Tait), two English runners (Diane Leather and Anne Oliver and one Polish athlete (Halina Gabor). . Diane Leather won in 2:18 with Gabor second in 2:19.8, Anne Oliver was third and Molly, the reigning SWAAA 880y champion fourth. Ann Reilly, reigning SWAAA 440y champion was fifth and Barbara Tait, reigning mile champion, sixth. The other scratch invitation international was held at Ibrox on 15th September in the Daily Express Floodlight Meeting. There were eight runners – three from England (N Smalley, H Vincent and B Loakes), two from Scotland (Molly Ferguson and Ann Reilly), one from Holland (Stien Scharleman), one from East Germany (U Donath) and one from Poland (B Pestkowna). The promoters were not overlooking the women any more. Leather won in2:09.7 with Donath second in 2:09.8 and Gabor third in 2:11. neither Leather nor Gabor were in the official programme. 11956 was a good year for Molly- second in the National Cross-Country Championship, first in the SWAAA half-mile after being third in the previous two championships and then the two big invitations to close the summer season. At the other end of the scale that summer was the Larkhall Sports Association’s meeting at Broomfield Park. The meeting preview commented that “an innovation, the women’s half mile has attracted a good entry, headed by Scottish champion Molly Ferguson, Springburn.” Molly actually ran in two events here: in the half mile she lived up to her billing and won in 2:26.4 from club mate Doreen Fulton and then was third in the 220y behind E Rodger of Shotts and EM Sealey. TWO DISTANCE RUNNERS WHO CAN WIN AGAIN. However the win he forecast was not in the national championships that year. In the SWAAA 880 yards in June the pundits were proved wrong when the winner was SH Duncan of Edinburgh Harriers in 2:26. JP King from Streatham was second and Molly won her fourth medal in four years with third place. 1956 might have been a false dawn for Scotland’s women middle distance runners – there were no events for women at all this time at Cowal, only a 100y, 220y, or at Edinburgh where there was only an 80m Hurdles or at Shotts where there was only the 100y and 220y. There was no sign of Molly in the national cross-country at Auchinairn on 7th March 1959 which was won by a 16 year old, A Paterson from Aberdeen from Barbara Tait, but in the West District Trials on 16th May she showed that she had not gone away by winning the 880 yards in 2:36.7. In the inter-area at Scotstoun on 23rd May, Tait won in 2:26.4 which was a meeting record The SWAAA Championships at New Meadowbank on 13th June saw Molly win another medal, albeit another bronze when Ann Reilly, the outstanding 440 yards runner from Ardeer won in 2:24 from M McAuley (Edinburgh Harriers) and Molly. 1960 started with a fourth place in the national cross-country championships held at Pollokshaws. On to the track season and this year at the West district trials Molly was second in the 880 yards behind Ann Reilly of Ardeer who won in 2:31. On to the West v East, held again at Scotstoun, and Molly was second again, this time to Barbara Tait who also won the Mile. This was however the first year since she began competing as a senior that Molly Ferguson failed to gain a medal at the SWAAA Championships which was won in a slow time by Ann Reilly with S Duncan and M Donaghy (both Edinburgh Harriers) second and third. By 1961 Molly was now Molly Wilmoth, having married fellow Springburn Harrier Danny. The Scottish cross-country championship took place in Greenock and Molly was seventh behind Pat McCluskey, Dale Greig, R Wylie, Doreen Fulton, Barbara Tait and S Loftus. Springburn was second team behind Rankin Park and when Barbara Tait couldn’t run in the international, Molly was drafted in in her place. The Glasgow Herald report read as follows: “A team representing the Scottish Women’s Cross-Country Union finished fourth in the English Women’s District Championships at Sheffield over a three mile course. Miss P McLuskey (Rankin Park), the Scottish champions was ninth of the 204 competitors. Also in the team were Miss D Fulton (Springburn) fourteenth, Miss R Wylie (Doon) twenty first, Miss MF Wilmoth (Springburn) twenty eighth, Miss AS Loftus (Anglo Scottish) twenty ninth and Miss D Greig (Tannahill) forty third.” Molly had more than justified her selection. The winter season was now at an end and she now turned to the track again. In the West District trials she passed on the 880 yards and ran in the 440 yards instead and the result was published as “440 yards: 1. C Gillies (Maryhill) 64.1; 2. M Ferguson-Wilmoth (Springburn; 3. R Bowen (maryhill). In the West v East however Molly was second in the 880 yards won by Helen Cherry in 2:26.7 and the result was printed as follows “880 yards: 1. H Cherry 2:26.7; 2. M Ferguson.” Talk about confusion – four races, four different names – Mrs Wilmoth, Miss Wilmoth, MF Ferguson-Wilmoth and M Ferguson! In the 440 yards she had run 63.5 for thirteenth and 2:29.2 for tenth place in the end-of-season rankings. Although the serious racing stopped when Molly and Danny started a family, the involvement with the club did not stop and she did keep on running. Molly also did some running as a veteran, running in two IGAL World Veterans Championships. She ran at Perpignan in France in October 1983 when she was timed at 49:39 for 10000m. Danny also ran and did 40:18 and the next day 1:53.22 for the 25K. Walter Ross, the founder of the Scottish Veterans Athletics, drove a bus full of Scottish competitors to the meeting but Danny and Molly made their own way there and turned the event into a holiday. Molly also ran in the event at St Anne’s in June 1985. Between these two events she had what she says is her only race on a tartan track when she ran in the Vets Track and Field Championships at Meadowbank on 29th July 1984. She was second in the 440 yards behind Barbara Colwell in he W45 age group. In September 1995 Doug Gillon notes in the Veterans Championships Molly Wilmoth, nee Ferguson, twice National half-mile champion, took the 100 yards title in the 55-plus division.” But then, she could always sprint a bit winning such events as the 220 yards at Falkirk FC Sports when she was running really well in the 50’s. With sports meetings often having only 100 and 220 yards events she ran her share of handicap sprints and won quite a few of them. Molly was very active at club level. 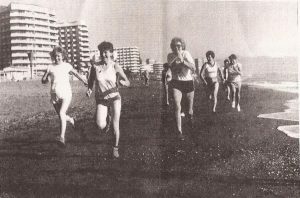 The Springburn Harriers Ladies had dwindled a lot after Molly, Doreen Fulton, Jean Muir and some others had stopped running. So Molly decided to start it up again in the late 1970’s, adopting the name of the local authority and so Strathkelvin Ladies AAC was born. She roped in old friends and colleagues such as former track and cross-country runner Aileen Lusk, persuaded parents such as Graham Sword to join in and the club worked well with lots of girls going along. There was help from men in the club and it was not long before Strathkelvin became Springburn Harriers Ladies again. They are quite successful at present (2013) but the success is mainly on the road and over the country with not as many track runners as in Molly’s day. By then however, she was a seriously good track official who was known throughout the country. She is not sure when she started officiating but was given an award in 2012 for having officiated at 50 consecutive Tom Scott Road Races. Starting as a Grade 4 track official she worked her way up through the ranks until in the 1990’s as a Grade 1 official, she was officiating at some of the top meetings in the country where the officiating has to be meticulous under the scrutiny of Press and TV as well as the competitors themselves. Among the many events at which she officiated were the Scottish Indoor Championships in 1995, the BVAF Indoor in February 1998 when she was track referee, the GB v USA match at Scotstoun in 1999, the Scottish Indoors in 2000, the Falkirk Reebok Cross-Country in 2003 when she was again referee. Brian Goodwin said that she should go for the cross-country referee grading and she went to the 2003 Reebok UK INter-Counties and World Trials at Wollaston Park, Nottingham, on 8th February 2003 where she was the referee. Closely watched and monitored by the English officials she came through with flying colours and became the first Scottish woman to attain cross-country referee status, and only the second in Britain. The first was Pat Green and the two became friends and many years later Pat was still asking after Molly. Also in 2003 was what she called “a momentous occasion for me” – being chosen to referee the European Cross-Country Championships at Holyrood, Edinburgh. It was indeed quite a significant honour but not at all one that was undeserved. They are both still working for the SVHC . 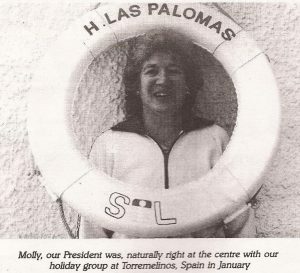 At the Vets annual ‘escape to the sun’ in Torremolinos in January 1990, Molly was President and again was strongly featured in the centre spread. In the pictures below we have Molly ‘at the centre of our holiday group’, with Pete Cartwright who won both 5000m and 1000m, running with other women on the beach, and finally with Life Member Willie Armour. Molly had joined the Vets Club as early as 1975 when it was in its infancy and entered the special invitation race at the men’s championships that year although she could not actually take part. The programme notes for that race say: Molly Wilmoth, Kirkintilloch. Over 35, Molly has been in the sport for some 20 years. Mother of two children, 12 and 9 years old, Molly is a former cross-country internationalist and twice winner of the Scottish 880 yards title. Coaches local girls at Kirkintilloch. She thinks the concepts of our Vets Association a wonderful idea. ” Danny and Molly worked hard for the SVHC and both served as President. Molly’s turn came between 1989 and 1991 with Danny a Committee Member holding different posts (some mentioned above) at that time. When the club started the annual trips to the sun in early Spring, Molly and Danny went with the rest – and they are still going as part of the group. Another very special experience for her was when she shared refereeing for the week of the Special Olympics at Scotstoun in Glasgow in 2005 – like other officials from this event that I have spoken to she really treasures the memories. Molly is still officiating and working long hours at meetings – in April 2013 she stood outside working at the Six Stage Relays which is one of the longest events in the calendar. Finally we should maybe look at some of her honours and achievements. * First Scottish woman to become a cross-country referee. And that’s only some of the honours that have come her way. It is now 60 years since she joined Springburn Harriers from Albert Secondary School and her officiating and enjoyment of the sport is just as sharp and comprehensive as ever it was.